Why did you start CleverMade? We both have always had a passion for solving problems and finding innovative solutions, and we knew that we wanted to create something to make everyday life easier. Our ideas began to flow when we visited Europe. We saw the technology they had that wasn’t being utilized in the United States, such as the folding crates. They were extremely durable and a convenient way to transport anything — the perfect alternative to single-use shopping bags. We knew we could bring them back to the United States and make them sustainable and strong to hold weight. We spent more than a year doing market research before we set our plan in motion. Smart design is fundamental to your products. How does that help solve everyday problems? CleverMade’s growing line of products pop up to hold supplies in style, then fold down to tuck out of sight. 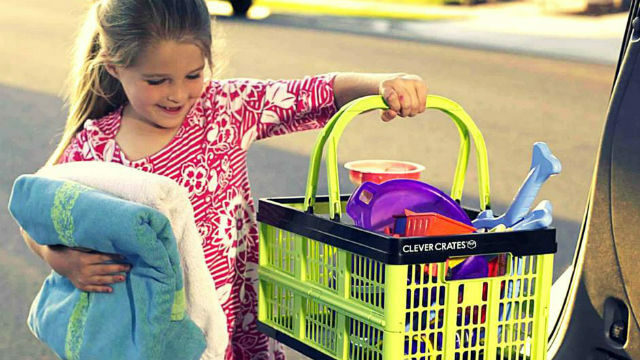 Following the success of CleverCrate, a stackable plastic crate that collapses when not in use, we introduced the SnapBasket, a lightweight and roomy self-standing bag that relies on the same shape-shifting design. Our products make life easier — it’s as simple as that. For instance, the SnapBasket holds up to 25 pounds and accomplishes 80 percent of most consumer-shopping trips with just two baskets. The multi-functional products cater to all types of people—from parents and teachers to compulsive shoppers and athletes. Our products get rid of the headache that comes from transporting items to and from—whether it’s to the beach, a farmer’s market or a sports tailgater. We see the need for everyone to have a more maintainable, pragmatic option for transporting and shopping. Currently, you can find CleverMade products nationwide at retailers and online—from our website at CleverMade.com and also on Amazon.com. A SnapBasket in a grocery checkout line. What has been the reaction from customers? Once folks try our foldable baskets and crates, they don’t want to go back to flimsy reusable bags or multiple trips to and from the car. We’ve created products that our customers don’t realize they need until they try them. Once they do, we’ve heard they can’t imagine their life without these products. CleverMade products give shoppers the peace of mind that they’re doing good for the environment when they shop by reducing the amount of single-use plastic bags they’re using, while guaranteeing their milk won’t crush their eggs in the back seat. What other smart design products do you have in the pipeline? There’s a cooler in the works with similar design elements to our SnapBasket and CleverCrate, which we can’t wait to put the finishing touches on and share with everyone. Besides that, we keep our website and social media updated with our latest products and announcements, so be sure to follow along with the adventures.